Do you want to install a Theme on your WordPress site? 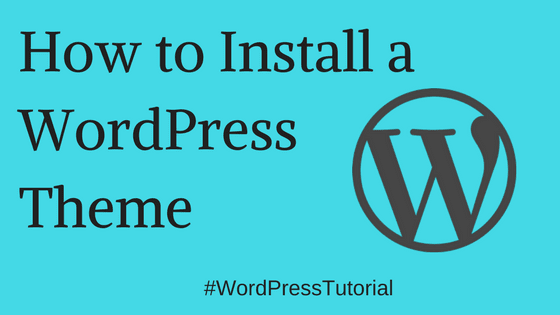 In this WordPress tutorial, I have shown a detailed step-by-step instruction on how to install WordPress theme. After creating a WordPress blog, every beginner looks for a quality WordPress theme on the Internet. After finding the right WordPress theme for your website, you would want to install and apply it on your website. For Beginner’s in WordPress: MyThemeShop has the fastest premium themes and plugins. They also offer some quality premium themes for free if you create a new account. In this tutorial, I will talk about 2 different ways using which you can easily install a theme on your WordPress blog/site. Note for existing users: Installing a theme is not a difficult task, but if you are changing your existing theme to a new theme, I’ll suggest you create a child theme before installing a new theme as this way you won’t lose any customization you have done on your theme. First, you need to go to your WordPress dashboard. If you’re not logged in, then login to your WP-admin page via http://yourdomainname.com/wp-admin. Replace yourdomainname.com with your actual domain name. On the dashboard, at the left-side navigation menu, go to Appearance > Themes. 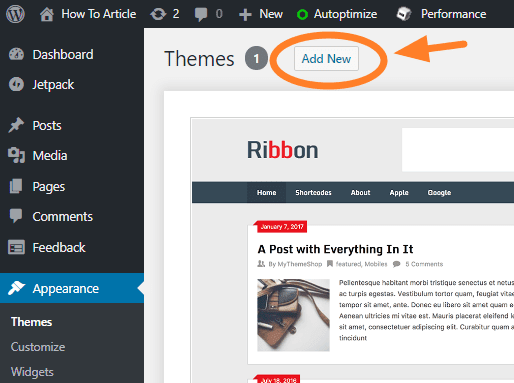 Now click on “Add New” button at the top to go the Theme Dashboard. Here, you can search and install themes. You can also narrow down your search by using the “feature filter” option or you can even search for a specific niche as a blog, business, news, sports, magazine, etc. Once you have decided which theme you want to use, move your cursor over that theme and click Install to install that WordPress theme. Now, click on Activate to make it your currently active theme. That’s it. You have successfully installed and activated the WordPress theme via theme directory. Additionally, you can check and customize features of your theme by navigating through Appearance > Customize. If you have downloaded WordPress theme(.zip) file into your computer. 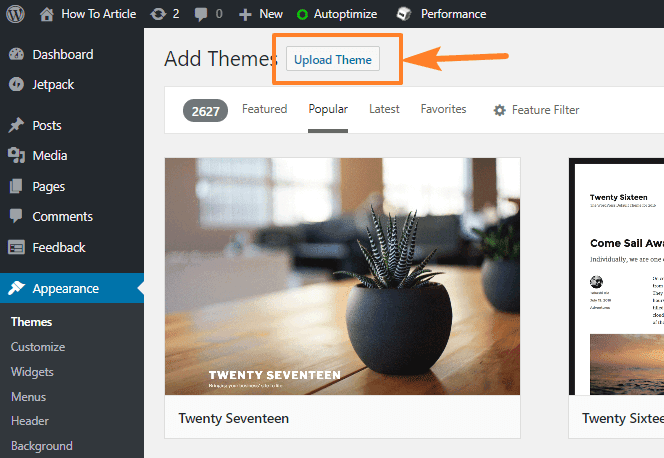 You can install that theme using the upload method from your WordPress Theme Dashboard. This method comes as handy when you have purchased a premium theme from ThemeForest, Envato, etc. Before uploading the theme make sure the theme is compressed as a .zip file. 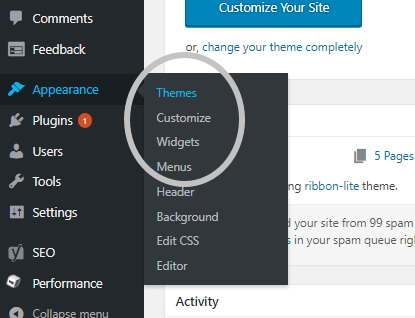 Go to your WordPress theme dashboard by clicking on Appearance > Themes. Click on the Add New button at the top, on the next screen Click Upload Theme. Click Choose File button. Select the file from your computer and click Install Now button. Now your theme will be installed and a successful message for installing theme will appear on the screen. Now click on “Activate” link to successfully install and activate your downloaded WordPress Theme. I hope this tutorial helped you install a WordPress theme on your website. If you’re not aware of, there’s another way to install themes but it’s not recommended for beginners. Its called manual installation of WordPress theme, read this article to learn how to manually install WordPress theme. If you need any help or guidance related to WordPress, let me know in the comment section below.